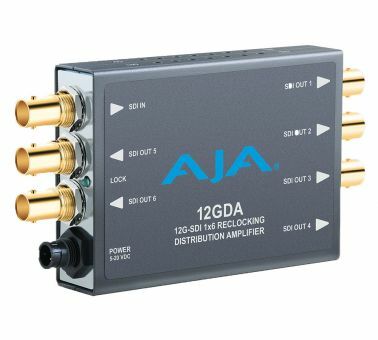 12GDA is a miniature 1x6 12G-SDI re-clocking distribution amplifier that allows facilities to save on cable runs and install times. With support for 12G-SDI for 4K/UltraHD single link workflows, the format-agnostic device features six separately buffered SDI outputs identical to the recovered input. It also offers automatic input detection, re-clocking and cable equalization, as well as a throw down package and LED signal detection indicator.